ATTITUDE: 2009 will be the fourth year for the Beachley Classic. The northern beaches of Sydney are no stranger to competitive surfing and the girls will certainly up the ante for the local spectators. The crowds will be out in force, screaming for their girls, creating an atmosphere unsurpassed. THE WAVE: The northern beaches of Sydney are littered with quality banks and points. Depending on the contest venue, this could mean the girls will be punting in punchy beachbreaks ,screaming over rocky points and locking down time in the green room. PERKS: The fans - Aussies think surfing is super. Expect a huge turnout to support their hometown heroes. PERILS: The sun. Zink up ladies, as those UV rays are awfully powerful here. Traffic and yuppies can also get annoying. APRES SURF: Stroll on into the city for some shopping, dancing, or the odd cocktail. Head to the world famous Taronga Zoo, or take in some culture at the Opera House. Sydney offers a bit of everything for everybody. The Beachley Classic is not complete without dinner on the Corso backed up by alcohol fueled fun the Stein Hotel. 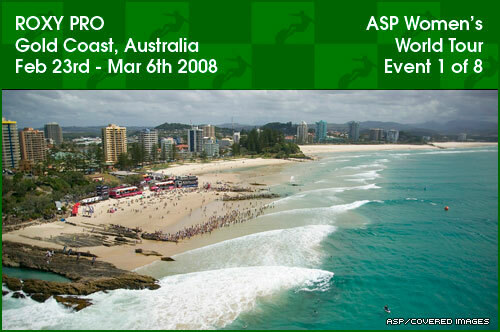 ASP WOMEN'S WORLD TOUR HISTORY: 14 Year Old Supergrom, Tyler Wright upstaged the competition here in 2008, when, Just like Steph, she heralded her arrival onto the scene by knocking out some big names and claiming the No.1 spot. NOTABLE: The government got involved in this one ya'll. New South Wales is a strong supporter of Layne, women's surfing and this event. It was at this event in 2008 that Layne announced her retirement, monumental to say the least.